KATHMANDU - Fresh ice avalanches struck on a perilous route where 16 Everest sherpas were killed last week, hiking officials said on Friday, making it almost certain that no one will summit the world's highest mountain from Nepal during this year's climbing season. "Teams are leaving, it's over for all," said leading climber Alan Arnette on his website. "Time to mourn and regroup." Many expeditions abandoned base camp this week after an April 18 avalanche killed 16 guides who were cracking ice and fixing ropes on the upper reaches of the Khumbu Icefall. He said these sherpas were determined to ensure that no one scaled Everest from the south side during this year's climbing season, which ends around May 25. It would be the first year of no summits since commercial climbs took off in the mid-1990s, though there will be attempts on the north side from Tibet. "I could see fresh avalanches falling at the same spot that was hit last week," Ang Tshering Sherpa of the Nepal Mountaineering Association (NMA) said in Kathmandu after returning from base camp. No one was hurt in the latest avalanches as there was no one on the unstable Khumbu Icefall. Ed Marzec, a 67-year-old Californian who had hoped to become the oldest American to scale Everest, said there was a "crack"of ice as he was waiting on Thursday for a plane to take him off base camp. "The sherpas say the ice conditions have changed so much and so rapidly, they have created extremely dangerous conditions which prevent finding a safe route to the summit," he said in comments emailed by his friend, Daniel Beer. But Ballinger said that with so few sherpas left, it would be virtually impossible to set out. "You need this critical mass of people to keep digging and putting the route back in," he said. "Non-professional recreational climbers ... just don't have the power to push through those conditions without significant sherpa support." The government said on Thursday it would allow those who pull out after the disaster to return without paying extra fees for permits within five years. Guiding foreign climbers is the main livelihood for sherpas, helping them make up to US$8,000 (S$10, 055) or more each year in a country with an average annual income of just over US$700. 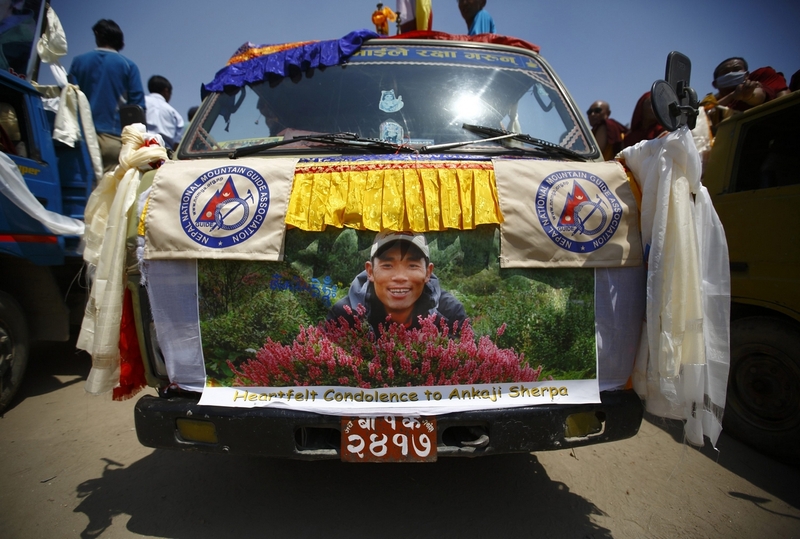 A portrait of Ankaji Sherpa, who lost his life in an avalanche in Mount Everest last Friday, is seen on a truck carrying his body during a funeral rally of Nepali Sherpa climbers in Kathmandu April 21, 2014. 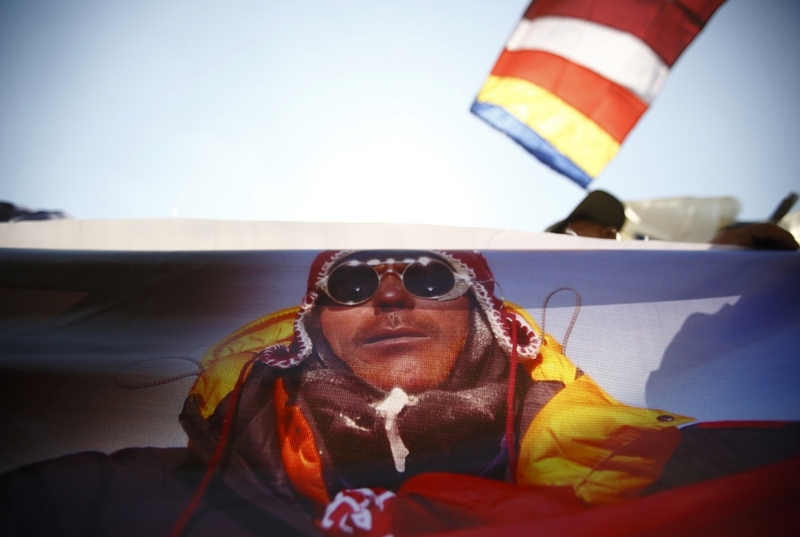 A portrait of Dorjee Khatri, who lost his life in the avalanche. 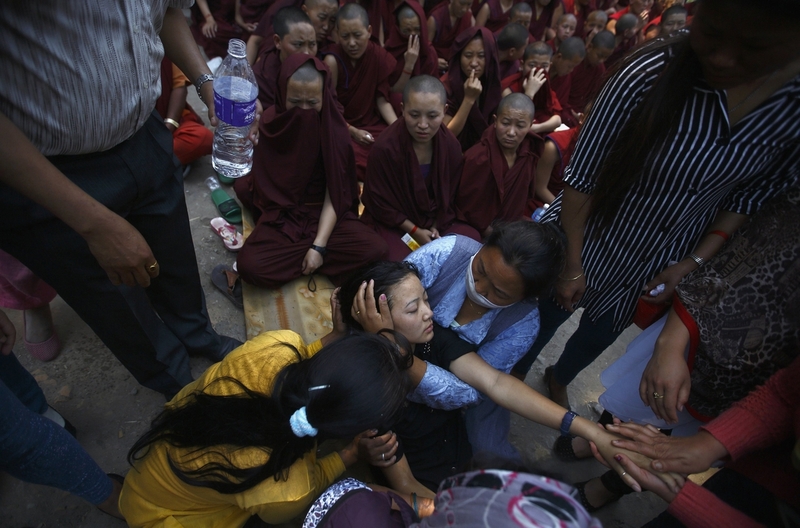 Family members comfort the daughter of Ankaji Sherpa. 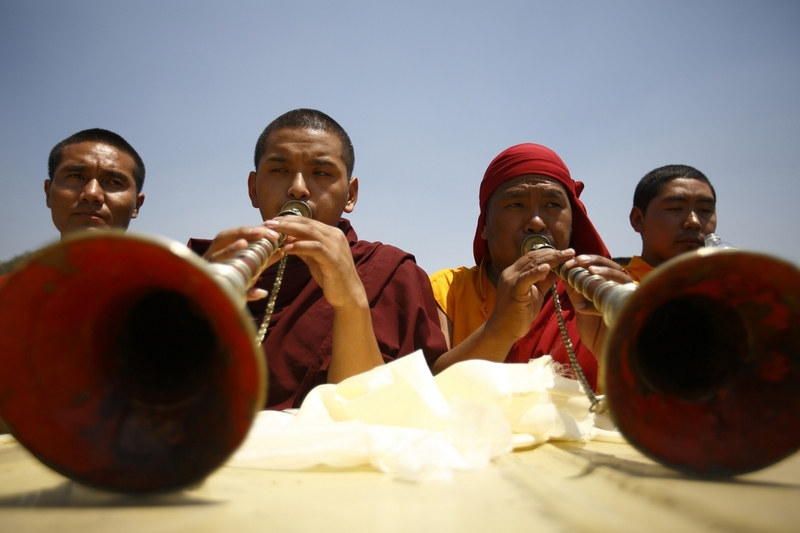 Buddhist monks offer prayer during the funeral rally of the Sherpa climbers who lost their lives in the avalanche. 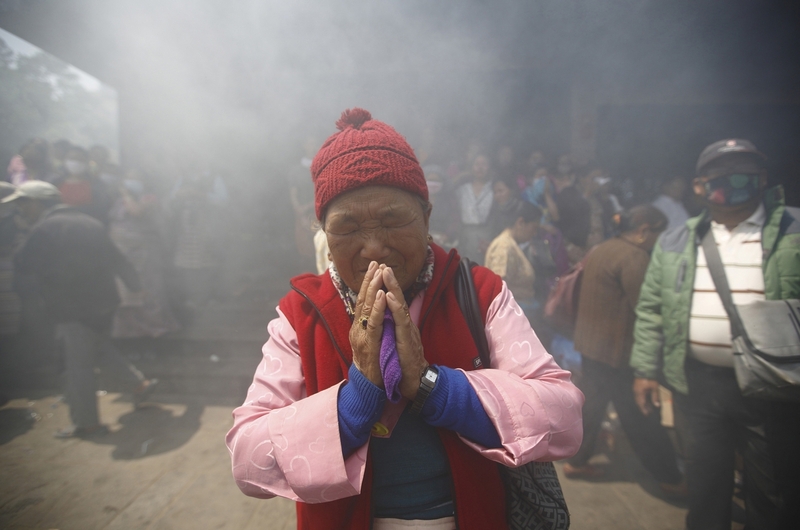 Family members perform final rituals at the funeral pyre of a Mount Everest avalanche victim. 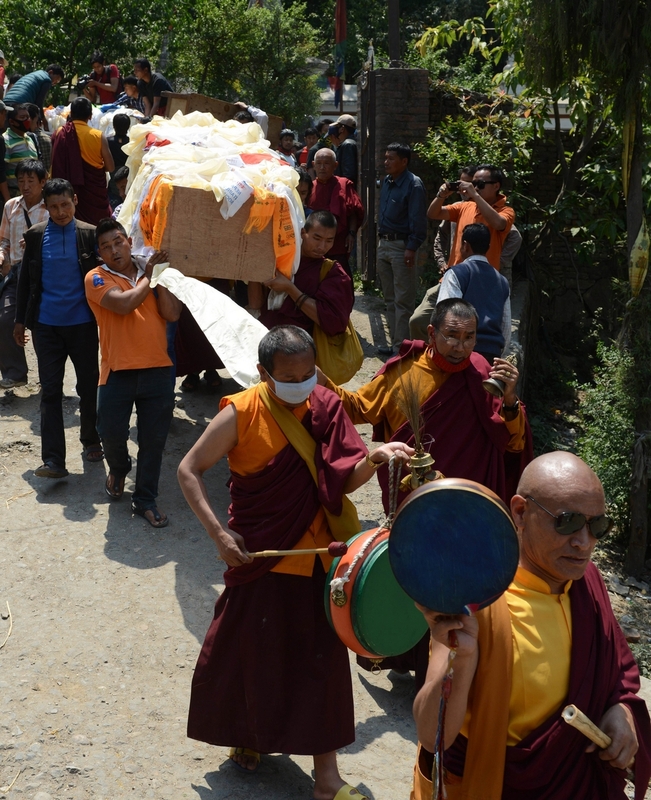 Buddhist monks lead relatives carrying a casket bearing the body of a Mount Everest avalanche victim for cremation. 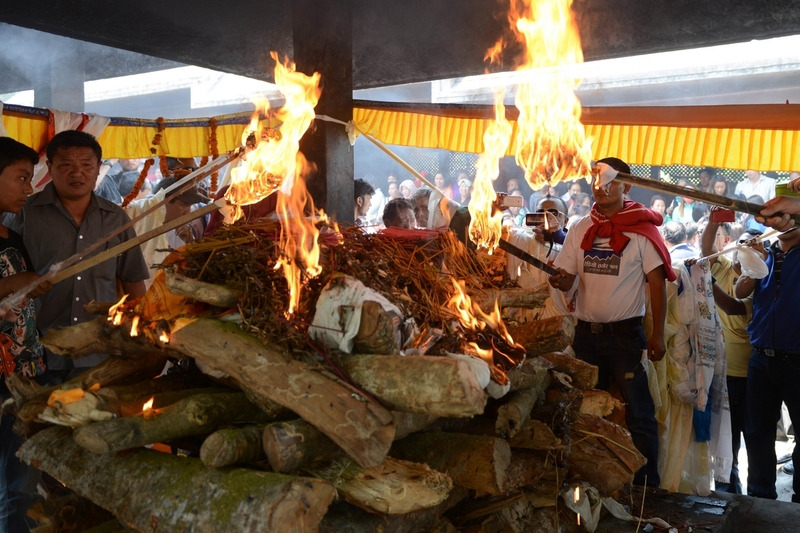 Mother of Ankaji Sherpa pays final tribute to her son during the cremation ceremony. At least 13 people were killed in the avalanche above base camp but the toll is expected to rise. 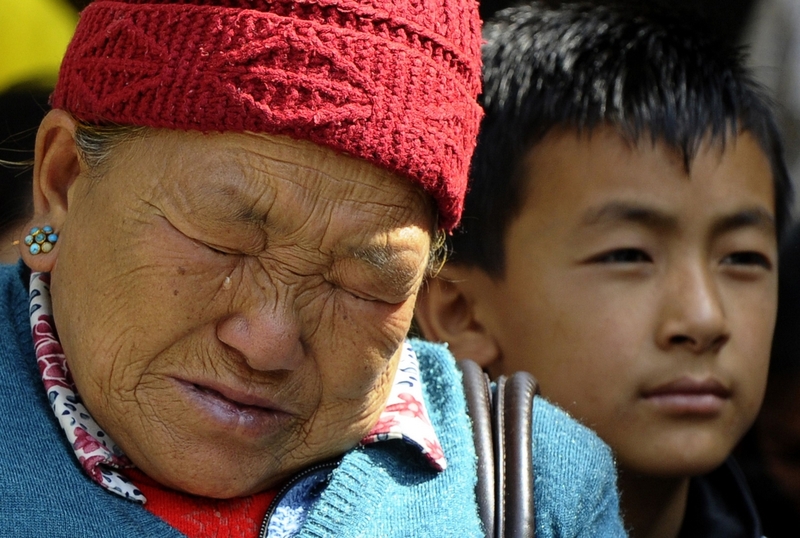 The mother of Mount Everest avalanche victim Ang Kazi Sherpa weeps as she waits for the body of her son to arrive at Sherpa Monastery. 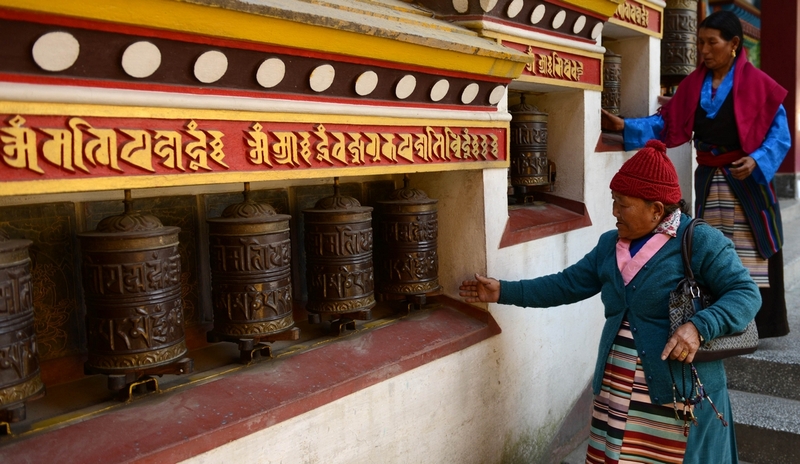 Mothers of Nepalese mountaineer Ang Kazi Sherpa (L) and Phurtemba Sherpa (R), victims of the avalanche, spin prayer wheels at the Sherpa Monastery. 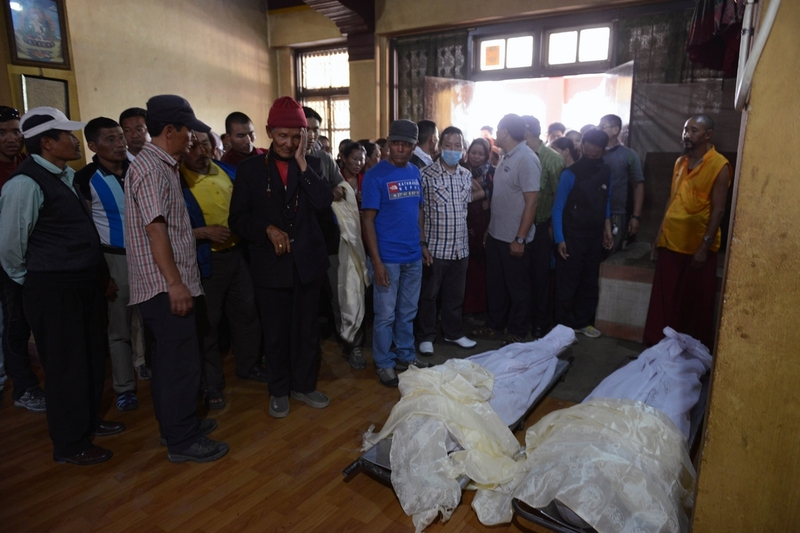 Relatives of Mount Everest avalanche victims give their last respects after the bodies arrived at the Sherpa Monastery. 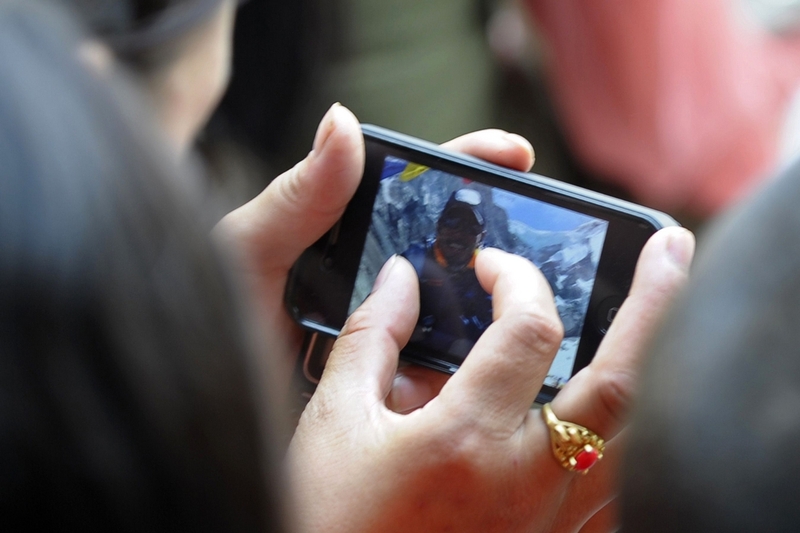 A photograph of Mount Everest avalanche victim Ang Kazi Sherpa is pictured as his children look through photographs on his recovered mobile phone. 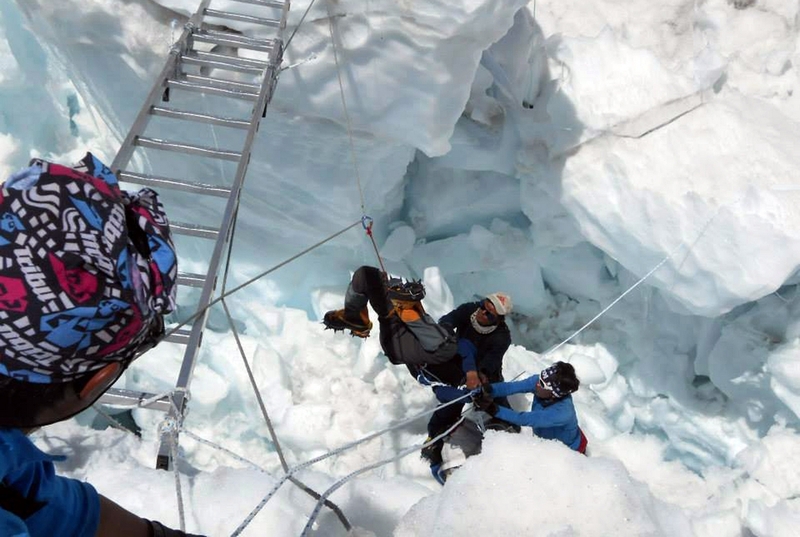 Nepalese rescue team members rescue a survivor of the avalanche. 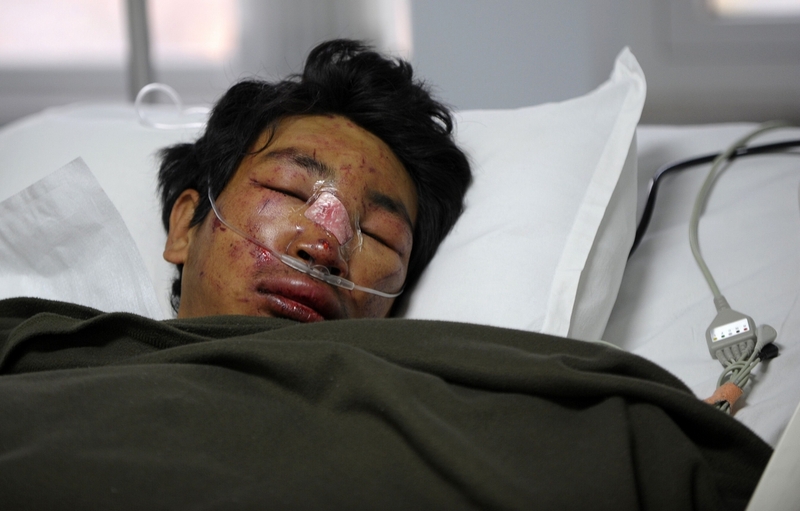 Nepalese mountaineer, Dawa Tashi Sherpa, survivor of an avalanche on Mount Everest, lies in the Intensive Care Unit at Grandi International Hospital in Kathmandu on April 18, 2014.